The new RS Ford 4 cylinder has 345 horsepower with all-wheel drive and returns times 0 to 100 km/h in just over 4 seconds. 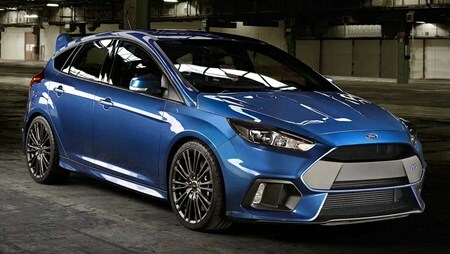 While Henry Ford is supposedly the author of “any color as long as it is black”, the new RS comes in two colors – white and blue, though there is an option called ‘Prestige Paint’ offering two more colors – grey and black. Where the previous RS Focus was fitted out with clever limited-slip differentials and complex independent suspension to stay on the black stuff, the upcoming RS is using all-wheel drive in an effort to rein in its 345 HP. This upcoming RS is the first to utilize all-wheel drive and cast alloy 19 inch wheels, though there is another option to fit 19 inch forged alloys for the real boy racers. Advertised as both lighter and stronger than the standard Focus RS rims, the high-spec forged alloys are shod in ultra-low-profile 235/35 R19 Michelin Pilot Sport Cup 2 tyres. This car has to be the ultimate boy-racer’s chariot! Previous articleThe greatest driver of all time? Which company needs a car guy?